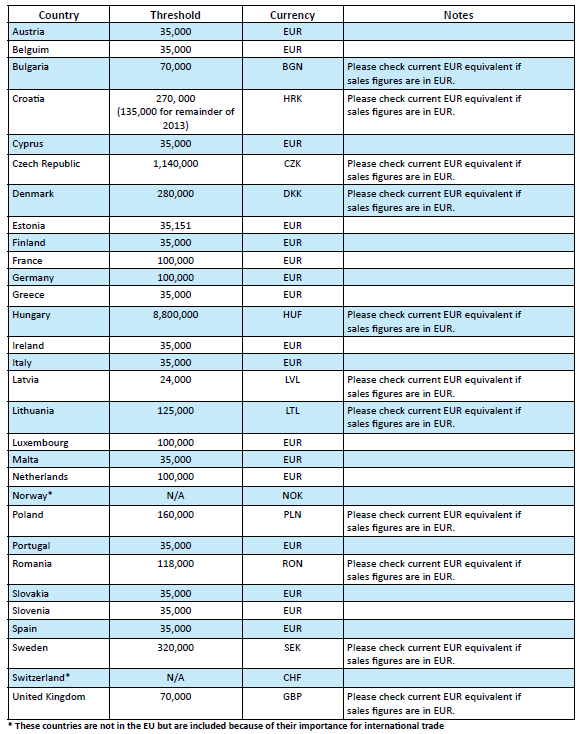 Distance Selling takes place when a business sells and delivers goods cross border to a private individual or a non-taxable business in another EU Member State. The most common example of Distance Selling is that of an e-commerce transaction. The Distance Selling Rules state that once the Distance Selling Thresholds are breached in a Member State other than that of its establishment, the company must register for VAT in that Member State, and start charging and accounting for local VAT. The place of supply moves to where the goods are delivered once the thresholds have been exceeded. These rules are in place to avoid distortion of competition between the 28 Member States of the EU. Each tax authority has the ability to set their own VAT rate, and if there were no Distance Selling regulations in place, private individuals based in the UK (where VAT is currently 20%) could buy all their goods from a company based in Luxembourg (where the VAT rate is 15%) for a reduced cost. The Luxembourg tax authorities would always be at a VAT advantage, to the detriment of the UK tax authorities. Christmas is often a very exciting time for ecommerce businesses, with sales often increasing exponentially over this period. £450 m worth of sales are expected on ‘Mega Monday’ alone this year, with more than £113m transactions taking place online. However, the fast paced nature of online businesses also increases the risks of them crossing Distance Selling thresholds without realising, or being too busy to deal with it when necessary. Nonetheless, great care must be taken when selling cross border because the profile of Distance Sellers has never been higher amongst the tax authorities across the EU. With each tax authority trying to raise revenue at the moment, being strict with Distance Sellers provides a convenient way of bringing in that extra money because they collect straight from the taxable individuals – the consumers. If a business fails to register for VAT at the correct time, fines and penalties can be applied. If the tax authorities discover a retrospective issue before you disclose it, then they will often treat you in a harsher light than if you had given the information voluntarily.